Except for the noise of sporadic fireworks in the neighborhood back yards 2008, (my 63rd), quietly slipped into history. My wife and I ordered pizza, watched America’s Funniest Home Videos, some Fox News and the dawn of a New Year was upon us. Even in the midst of a failing economic climate ’08 was a very good year for the Ogle’s. We were blessed in so many ways I can’t list even most of them. Our greatest blessings are the wonderful people we have met and know. Carol has recruited even more gals for her chapter of Sweet Adeline’s and through her work with WFR Relief has made many wonderful friends and acquaintances. Our Grief Share ministry has allowed us not only to meet some dear folks but to be a part of their healing as well. And, I began two weekly meetings with groups of believing men who have been an enormous blessing and a joy to my life. God has been very, very kind to us indeed. We are excited about ministry opportunities, travel, a garden, bluebonnets blooming, singing competitions, fishing, NASCAR, and a host of other things in no particular order. Life is good and sharing some of it with you, my readers, is a joy. My sincere hope is that something I post here will guide someone to Christ, encourage someone to follow Him more closely, to love Him more deeply, and to love those He loves in more tangible ways. So I am happy to welcome a new year but my hope is in the One who lives outside the time/space continuum and knew my future before I had my beginning. In good times or in bad He is with me. No man can ask for more. Today, Christmas eve 2008, has been a wonderful day. I arose at 5:30 a.m. and drove across town for a weekly Bible study. Several men and I meet at 6:30 a.m. every Wednesday to fellowship, pray, and be challenged from the Word of God. Every week I am blessed by being with those good men whose lives encourage me to be all I can be for God. I came back home and had a very long nap in my king size Lazy Boy recliner. (How appropriate is the name “Lazy Boy” for my chair?) In the afternoon Carol and I did some last minute Christmas shopping and then went across the river to a Christmas eve service at First Baptist West Monroe. It was a candle light service and we worshiped in song and taking the Lord’s Supper together. It was a warm, inspiring worship experience. The pastor, John Avant, told us briefly about his visit with Dr. Billy Graham yesterday the 23rd. He traveled to Billy Graham’s home in NorthCarolina, (just a few miles from my family home) with the president of Chic Fillet. He spoke with passion and joy about singing carols for the beloved evangelist who is confined to his bed. Dr. Graham is 90 years old and still an encouragement to all who come into his path. He will soon be gone and there will not be another who will preach the gospel of Christ to so many millions as he. Last night, my daughter Kelly and her family joined us for food, fun, and exchanging gifts. The boys were excited about bedroom shoes, bath robes, and lazer tag. They played ping pong on their new table, a gift from their grandparents. They are such a joy. Kelly is a gifted, beautiful, funny wife, mom, teacher and mentor to her students. Our son in law Jorgen (pronounced “yawn”) owns and operates an Ace hardware store, a Maggy Moo’s Ice Cream store in the mall, and is also very active in a marketing company. Nine year old twins, Corbin and Kevin, and their older brother Jorgen III who is 12, keep mom, dad, and us grandparents very busy indeed. We just watched a Christmas special on Fox News channel from Saddleback church and Rick Warren and then the Fox and friends crew had a nice Christmas program too. In today’s politically correct world, what a refreshing thing for the number one news network to actually read scripture and talk about Christ coming to save sinners from their sins! I applaud them for doing so. Tomorrow we will drive to Keller, Texas to my son’s house where we will celebrate Christmas with him, his wife and daughters. My son Jason recruits doctors for temporary assignments and his wife Trina is a speech pathologist for the Keller school system. They have three daughters, Kelsie 16, Adysen8, and Allie who is 7. Each is unique and precious and we love them very, very much and look forward to spending time with them. Both of our kids and their spouses are devout followers of the Christ and are active in their churches and leading their children to be people of God. I have much to be thankful for this Christmas season. This year has been wonderful. 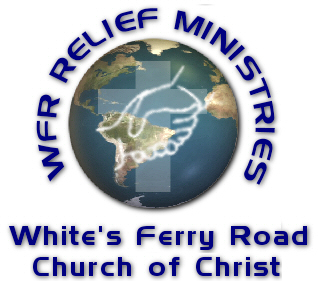 Carol and I have had lots of opportunities for ministry through her work with WFRRelief and our Grief Share ministry. Carol, my beautiful and amazing wife, has spoken to women’s groups, leads a Heart to Home group, teaches the Bible, does the public praying for her chorus group and sings with the chorus and her quartet Sweet Harmony. On one Saturday recently they sang at 6 different places. What a delight to have such a talented and gracious wife. I have had the wonderful blessing of joining God in His redemptive work. God has honored His word and I was blessed to have a part in reaping the harvest. For this and every opportunity to lead others to Him, or to help them more fully trust Him, I am humbled and grateful. It is far, far more than I deserve. Christ is indeed the gift that keeps on giving. If I have another day, another week, month, or many more years to live on this earth I pray that I will continue, as weak and frail as I am, to follow Him where ever He leads. I expect 2009 to be a great year. It, like all the years of my almost 63, will be full of problems, difficulties, hardships, and disappointments, but through it all, whether alive or dead, I will be a victor in Jesus. I am humbled by what God can do with an average country boy with lots of warts and bumps spiritually, but who though oft times stumbling, and sometimes falling, continues to follow, and has for over 45 years. In the last few days I have had visitors to Grace Digest from several countries around the world and from many states. I am amazed. Soon Carol and I will begin our 5th year of facilitating Grief Share groups for those who have lost loved ones. And, there are many who need to be loved, encouraged, prayed for, and many, many folks must hear about this Christ child who has provided eternal life for everyone who will trust Him. May God bless you. Merry Christmas and Happy New Year.